Features of the Exergen TAT 2000 Temporal Scanner: The TAT-2000 allows the choice of using disposable covers or cleaning between patients with a disinfectant wipe. The temporal artery, easily visible in an infrared image, is scanned to find the peak temperature. The patented Arterial Heat Balance (AHB)TM method converts this peak to a core temperature by replacing the heat lost from natural cooling of the skin. Convenient one-handed operation. Perfect for use with newborns, infants, children or adults. Precision Infrared System captures naturally emitted heat from the skin over the temporal artery. Selects most accurate of 1000 scans per second. Wide measurement range. LED display - Large, bright, easy to read. Fast and easy to use. Three year warranty. Audible indicator - Gentle audible sound indicates as higher temperature has been detected. 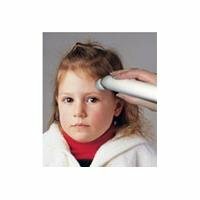 LED scan indicator - Indicates temperature is being scanned and flashes when a higher measurement is detected, indicating the location of the temporal artery. Auto-Off - Thermometer shuts off automatically to preserve life of battery. Low battery indicator - Warns user to replace battery. Latex free. Operates on one 9V battery. The product referenced on this detail page is sold be Each.